Cruise Toronto provides the perfect venue for a Corporate Event, Wedding, Private Party or Dinner Cruises in Toronto's Harbour. Enjoy a spectacular sunset evening cruise or a casual afternoon tour. We have proudly provided Toronto boat cruises since 1991, with excellent service and a lot of style. Join us aboard our boats for a memorable experience, as we transport you and your guests to a place where delicious cuisine, attentive service and spectacular Toronto Harbour views create an event like no other. 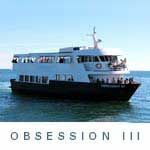 We specialize in cruises for elegant weddings, fun-filled company socials, corporate events, dream prom nights, and private parties. We also offer exciting additions like Casinos, Karaoke and Entertainment packages. Your boat cruise will take you in and around Toronto Harbour and the Island lagoons to give you and your guests the best city views possible. Let our professional team customize every detail just for you. We operate boat cruises in Toronto Harbour seasonally from April to October.